Facebook Advertising or Google AdWords: Do You Know Which One is Better for Your Business? As you go about allocating your online marketing dollars, you may wonder at some point if you should be pouring money into a Google AdWords campaign, or trying your luck with Facebook advertising. Though Facebook gets a lot of negative press- especially among smaller businesses looking for ROI on their Facebook presence- there are plenty of signals that the social network is aiming to be a significant player in the online marketing space. In short, you may not want to pass over it so quickly. So, if your marketing budget is tight where should you focus your funds and your efforts? The answer is that it really depends on the setup and goals of your business. While AdWords is better for targeting people and receiving click-throughs, the whole idea behind Facebook marketing is actually participating in the social experience and building a recognizable brand. In fact, the two networks fulfill two very different goals. Both Adwords and Facebook give advertisers the ability to target their ads to a specific geographic location and include other variables, such as demographic data. But, that is where the similarities end. With Adwords, when people are looking for specific solutions and/or specific information online, your job is meet that demand by bidding on the right keywords, creating compelling ad copy, and setting up an effective landing page. With Facebook, on the other hand, the data provided in members’ profiles and activity across the network is used to help target ads. Over the past year or so, Facebook has been introducing a series of easy-to-use apps and features, such as Promoted Posts, Sponsored Stories, analytics capabilities, and hyper targeting that can greatly enhance a small business’ marketing return. Another attractive benefit to using Facebook advertising is that it’s a lot lighter on the budget since most of the marketing can be handled organically- you just have to factor in the added time to engage with others on the platform. If you are primarily looking to increase your brand awareness and online visibility, Facebook may be the way to go. Brand awareness is built by establishing lasting relationships, and one of the best places to do this is in social networks like Facebook. So the bottom line here is: If you’re selling a specific product or service that enough people are searching for online and you are looking to simply pay some money for advertising and essentially walk away from it, then Google may be for you. 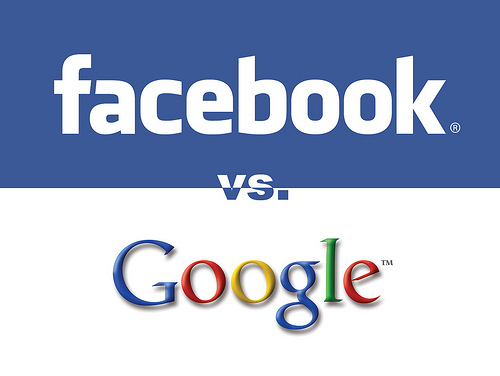 On the other hand, if you want to expand your branding efforts and build relationships with your customers, then Facebook may actually beat out Google as your platform of choice. Why Has Bank Lending To Small Businesses Been Declining For The Past 15 Years?